Yet again, those in the medical cannabis industry can heave a sigh of relief. For now. 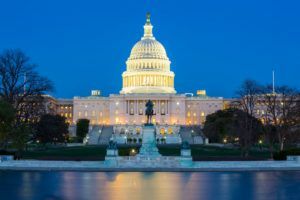 Under the terms of a new federal budget deal approved Monday by Congress, the Rohrabacher-Blumenauer Amendment will be extended at least once more, until Feb. 8, when the agreement expires. “Medical marijuana protections still remain until that date,” Correia wrote in an email to Marijuana Business Daily. The amendment – previously known as Rohrabacher-Farr – ties the hands of the U.S. Department of Justice and its director, Attorney General Jeff Sessions, by prohibiting the agency from using any federal money to interfere with state MMJ laws or businesses. The measure does not protect recreational marijuana companies. This is the seventh time the amendment has been temporarily extended by a continuing resolution from Congress, which hasn’t passed a new federal budget since 2015. The amendment’s ultimate fate is still arguably in doubt, however, because GOP congressional leaders haven’t allowed it to come up for a vote in the House of Representatives. The amendment was added to a Senate appropriations bill last year, but the competing spending bills between the two chambers were never reconciled. The only way the measure will be placed into law permanently is for Congress to approve a stand-alone bill instead of as a budget amendment. But there’s been no indication yet that such a bill may gain any real traction in the Capitol. Anyone who thinks Congress represents the people is a fool. These corrupt thieves are so disfunctional they should all be fired. They will fight for the rights of illegal aliens, while holding our citizens hostage. It’s no wonder they never get past a 12 percent approval rating. But they don’t care. I am repulsed by BIG Pharma’s production of uncountable OPIOIDS. That is just a bandage to an addiction. Then possible DEATH. Cannabis is natural. It had been proven to help people that have life long dabilaltating diseases. There is no cure for what I am living with. But, the Pain is so horrible at times. They keep giving me pills. I have an entire bottle that I have not taken. I want to get a card for Medical Marijuana or, CBD oil. I don’t like the idea of smoking. I believe that Cannibis is much safer than the poison narcotic pain killers that lead to addiction and greatly effect many other problems especially organs. Cannibis Jas already proven to be a much safer choice for relief for chronic diseases and pain relief. After 8 years of opiates that don’t work..
Heres a simple question to any lawmakers. Would you take opiates and they don’t work? Would you take more? Side affect of overdose is, DEATH. Medical cannabis works,, if you overdose sleep it off, but Pains gone and you can function..